It's rare to see contracted heels on a horse that does not wear shoes. It's also rare in ponies and draft breeds and draft crosses. Contracted heels are most often caused by the way we interfere with the natural growth and function of our horse's hooves. Shoes are often blamed for contracted heels, but just because a horse is wearing shoes, does not mean they will have contracted heels. 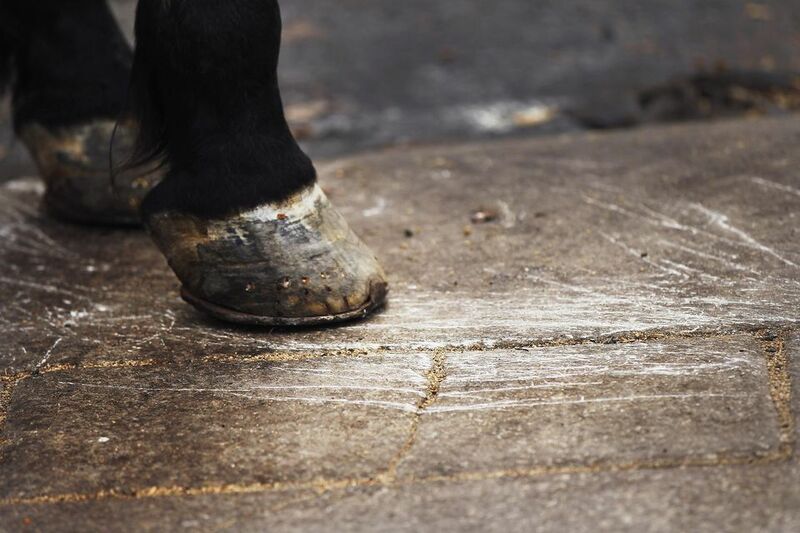 Many horses wear shoes for their entire life and still have perfectly healthy hooves, but some horses, even if they are barefoot, may be susceptible to contracted heels if regular balanced trims are not maintained. The key to hoof health is to find a skilled farrier who knows how to trim a foot properly and apply shoes the correct size and ensuring that your horse is trimmed and its shoes replaced regularly. Although they are called contracted heels, the whole foot may be contracted—narrowed and long. Since the shape of the hoof is changed, it may set up conditions that predispose the horse to navicular disease and founder. Narrow heels, low heels, low in the heel. Contracted heels is not a disease or conformation fault. Contracted heels are the direct result of improper trimming and shoeing practices. When the hoof is trimmed in a way that lowers the heel and shod with a rigid shoe, it may become narrow and long. The wall of the hoof in the heel area can become lower, and the frog and the heel bulbs of the hoof contracted. This can make the frog appear shrunken, the hoof walls turned in, and the whole foot narrower. This happens because the weight is not evenly distributed, eventually shifting the hoof wall. The heels, and possibly the frog of the hoof do not hit the ground as is normal, Due to the altered shape of the hoof capsule, the blood flow in the entire hoof is restricted and all the structures within the hoof are affected. Horses are not necessarily lame as they develop contracted heels but may become lame because the hoof is not expanding and contracting naturally, and the soft tissues of the legs may become strained due to improper hoof angles. The deepened clefts of the hoof are an ideal environment for thrush to develop. The process of heels becoming contracted is a long one. One bad trim or shoe job won't cause contracted heels. Months and years of poor trimming and shoeing can lead to the problem. There is no home remedy for treating contracted heels. You'll need to consult a farrier and a veterinarian. Treating contracted heels can take a long time, as the hoof wall regrows and the other hoof tissue adjusts. A knowledgeable farrier will trim and rasp both the free edge and the wall of the hoof to encourage healthy growth, natural expansion, and balanced weight bearing. The farrier may recommend soaking the hoof to help the tissues expand, and using hoof moisture products. The aim is to return the foot to a more natural, balanced shape that allows proper cushioning and blood-flow within the hoof structures. If the horse can not go without shoes, special shoes that only cover a portion of the hoof may be recommended, and side clips or nails near the back of the hoof avoided. Pads may be used to bring contact to the frog. It can take many months of careful hoof rehabilitation and even then, a full recovery may not be possible. If navicular is suspected, a veterinarian can take X-rays and in conjunction with your farrier, plan further treatment. Unshod horses will rarely have contracted heels although it is possible. Shoes get a lot of criticism, but not every horse that wears shoes will get contracted heels or develop other problems. Shoes should not bind the foot and cause the hoof to conform to the shape of the shoe. A lot depends on the skill of the blacksmith and the health of the horse's foot. Whether the horse wears shoes or not, it should have its hooves trimmed at the correct angle. "Contracted Heels." Merck Manual. N.p., n.d. Web. 14 Nov. 2012. http://www.merckvetmanual.com/mvm/index.jsp?cfile=htm/bc/90718.htm. "Primary Contracted Heels: Cause & Treatment." Anvil Online. N.p., n.d. Web. 14 Nov. 2012. http://www.anvilmag.com/farrier/prmcnthl.htm.